Check out BetterBurque.org for in-depth, Albuquerque-focused articles about bicycle and pedestrian safety, infrastructure and more! MLK looking east at the Edith intersection. Though there are still issues with some of the intersections along the corridor, the changes have overall created a vastly improved cycling environment. In late 2014, we wrote an article called “A Great 2014 + The 2015 Forecast,” which can be found HERE. That piece covered positive changes that happened over the previous year and investigated some things we wanted to see happen in 2015. As of Tuesday, February 9, the Albuquerque Rapid Transit project, otherwise known as ART, was approved for $69 million in federal funding from President Obama’s annual budget. This budget has not yet been approved by Congress so the funding is not guaranteed. However, there is a very good chance this funding will be approved and allocated, based on similar projects being approved in the past. At the end of January Save Route 66 Central, the foremost antagonist in the effort to bring bus rapid transit to Albuquerque, published a critique of the city’s newest plan for the project. The entire letter can be found at this link. We would like to say, in short, that this letter is well-thought-out. It is filled with ideas that could be successful if implemented in conjunction with the ART project. Unfortunately, the letter is also filled with misinformation and other data taken out of context. The headlines always sound so romantic, don’t they? This week at Strong Towns we are going to focus our attention on the embarrassing mess that is the American system of transportation finance. Our premise here at Strong Towns has been, for some time now, #NoNewRoads, a rejection of any proposal to spend more money on this system until we undertake dramatic reform. That position puts us at odds with advocates on the left of our political spectrum as well as those on the right. So be it. The current political paradigm is bankrupting this country … . It’s time to create a new paradigm. Everyone loves a ribbon cutting for a new road project, but maintaining the infrastructure once it has been built is not quite as fun or exciting. Our current financing system emphasizes new construction without accounting for long term maintenance costs. Where are the Jobs in Albuquerque? This Map shows nearly every job in Albuquerque mapped as a dot. It was developed by a Harvard Ph.D. students named Robert Manduca and is discussed in the Washington Post. The map is in an interactive format that spans the whole United States. It is based on Census Data. 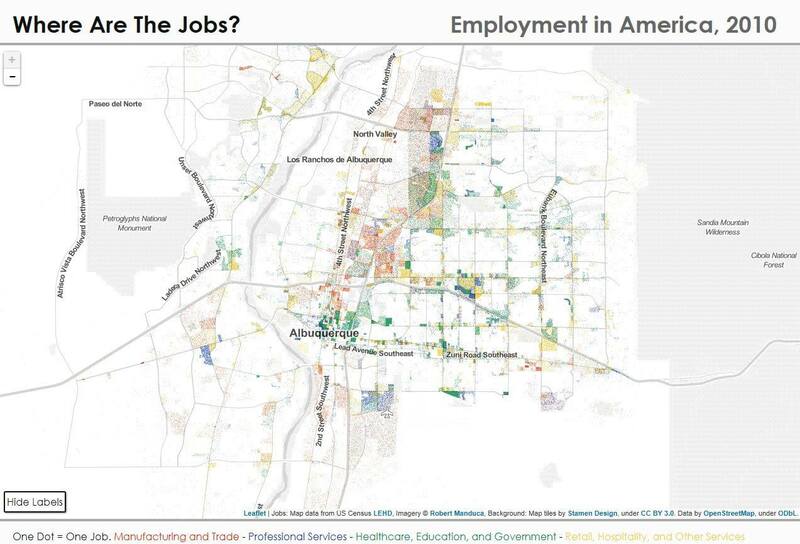 The map is important because it shows us numerous ways that the location of job development can effect Albuquerque. 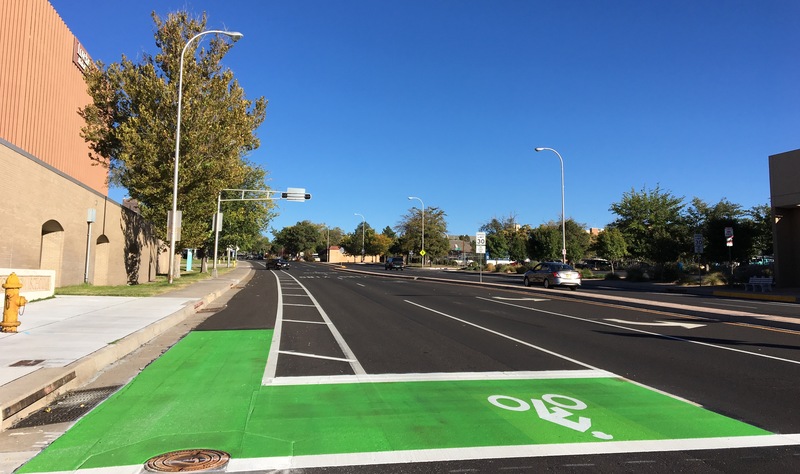 Another great post from Bike Yogi, this time about the City of Albuquerque Bike Plan. Read about all the details below!